You probably won’t remember how I used to spend the majority of my time. This was back when you spent more time with your nannies than with Mommy and me. Your Mom and I just made a big life decision, and I wanted to let you know what happened just in case this doesn’t turn out how we hope it will. If you feel like we spend plenty of time together, we go on family trips, I work from home, we periodically have lunch play dates, and I end my work day happy with enough energy to play – great! I am happy that our plans worked out. If you shy away from telling people what I do for a living, see me head off to work at my corporate job, feel like you never get to see me or are confused by the choices your Mom and I have made, well, let me explain. This is the most significant fork in the road of my life. I feel like I can see about 20 feet down this less-traveled path before the road is obscured by trees. For some reason, the first 5-7 years of my career, I never really thought of leaving my company, a big consumer products company. On paper, it was a good job – well-paying, tasks are different everyday, work with good people, room for growth, etc. But, I was never all that satisfied with it. I chalked it up to the fact that it’s a job, and I don’t have to love it. And, this was fine for a while. For the last 2 years, I have dreamed of finding something more closely linked to who I am. I have listened to podcasts, watched youtube videos, listened to audiobooks. I have learned that there is way more out there in the world than just the typical career paths that are so easy to get caught up in. For the last 2 years, I’ve known that the end of my time at this company would come; I just didn’t know when. During the summer of ‘18, I was informed that I would be moved into a new role that I strongly didn’t want to go into. I viewed it as a bunch of busy work, longer hours, and much less rewarding. My push back against the move wasn’t all that successful. The good news is that I was able to go down to a less-than-full-time work schedule. I worked 4 days a week for 80% of my previous salary. I believed that the additional time would allow me to find more rewarding projects that could potentially turn into a side hustle, spend more time with you, more time traveling, and potentially putting an addition on our home. My yearning for more was a smoldering flame nearing explosion. Right before Christmas ‘18, your Mom and I decided 2019 was the year I would quit. At first, the plan was to wait until my annual retirement account contribution by the company posted in August. As we talked about all the things I wanted to do, that plan was adjusted down to 3 months of successfully staying within budget, which meant living on her salary alone. This was a bit of a budget haircut, but it was certainly possible. We made a few assumptions to come up with this budget. We said for some period of time after I quit my job, we would allow ourselves to cease your college fund savings and significantly reduce her retirement account contributions. We took a few liberties in saying what counted towards the budget and what didn’t, but we primarily hit the budget for 3 months. And, thus, I was set free… sort of. Freedom isn’t free. There are costs and risks. There are a lot of benefits that come from going down the “normal” path. Most companies reward loyalty and experience. If you stay at a company for a number of years or decades you demonstrate your loyalty and acquire experience. This typically results in higher pay. And, if you work for a bigger company, that pay check will show up the same time every month without fail. By rejecting this stability, I am setting our family back in terms of reaching our financial goals. As a family, we are taking on more risk by going down to one income. I know that my income will come back in another form eventually, but I don’t know when that will be or exactly how. Is my happiness worth putting a damper on our family’s financial future? Will you (now ages 2 and 4) forgive me if your college funds are lower than what they could have been? Will you respect me for the choice I am making? Will you perceive it as copping out? Well, the theory is that I’ll come back happier and cooler than ever and with an income meeting and ideally exceeding my previous income because I will be passionate about what I’m doing. What I know to be true is that I won’t ever be meeting my true capability if I am not excited about what I’m working on. Is quitting worth it just because I don’t like going to work? It’s called work for a reason. It’s not always easy, and you probably don’t like doing it all that much. That’s why we get paid! The classical explanation is that my expectations are too high and I should just be happy with what I have – a good paying job with plenty of stability. Perhaps I have been jaded by my podcasting and youtubing role models, but I am choosing to pursue a line of work where I can put my whole self into it. I have made the choice to find “work” that I am internally driven to do, not just pushed into compliance of corporate policies in return for a paycheck. You will learn that this is true. If we knew that something bad was about to happen, we could stop worrying about it and start making actions that could help fix the problem. For me, not knowing how or when my income will be regained is highly stressful. Of course, if something really bad were to happen, I could go and get another engineering job. I would consider this a failure, but our family will always be ok. Even though we are absolutely guaranteed to not be homeless (we could always slink back to a parents’ or family member’s house), it’s really scary not knowing what I am going to do for income or where you are going to go to school, or how would we react if your Mom lost her job. Even though the self help mantra says fear and uncertainty are healthy if they are driving you towards a long term goal, it is still difficult to accept that for my life. To help me stay the path and pick me up when I second guess our decisions, there are a few principles I have chosen to live by. I honestly only know my immediate next step in my “career”, if you can call it that anymore. Somehow, I have to believe that ~5 years from now I’ll be able to look back and be eternally grateful that I took this giant leap of faith. Quitting will lead to my first non-corporate opportunity. That opportunity will lead to the next opportunity, and to the next. And so on. This is when enjoying the journey becomes important, because no opportunity will be perfect. However, each one will incorporate an additional component of my ideal life. Looking backwards, it all makes sense; however, gazing forward the path is completely opaque. If I apply a little bit of optimism to this concept, then my eventual success will only be possible because of the event immediately preceding it. That event was only possible because of the event immediately before it. And so on backwards in time, until this pending home purchase and rehab was only possible because I quit my job. This choice we are making right now is a critical factor in determining our family’s future. Quitting has actually already led to my first opportunity outside of P&G: a new house. Did we need a new house? Nope. Did we want a new house? Sure. Does it need significant renovation, is it in a good neighborhood and can we make some a profit by fixing it up? Yup. Would we ever have heard of this opportunity had I not had the plan to quit my job? Not at all! One day in January, we were at a friend’s house. Our friend had her mom over at the time. We were talking about our intent to get into real estate considering I would have more time after I quit my job. Our friend’s mom mentioned that a friend of hers was moving and was looking to sell her house in Lafayette Square. This is a nice neighborhood that we had always envied. This chance encounter led to us looking at the house completely out of curiosity, not intending to buy a home and move. We spent 3 hours there on our first visit while the homeowner watched our kids for half of it. We ended up putting in an offer that we expected would be a little lower than what she had in mind. It turns out it was a reasonable offer, and we compromised on a price in the middle. I can’t wait to find out what sort of opportunity this deal will unlock for us in the future… or maybe it’s just a mistake. We’ll see! 2.) If your current plan is not giving you the results you want, then you probably need to try something else. As a play on the definition of insanity, “doing the same thing over and over and expecting different results”, the same can be applied to our lives. If we aren’t getting what we want out of a situation, then we should probably try a different plan of attack. I had 4 different roles in the 11 years I was at my old company. It is a great company to work for, but I am certain beyond a doubt that I am ready to move away from corporate life. The part of the job that I (and I believe most people) enjoy is figuring out how to install new equipment and get it to run flawlessly. However, the amount of functional friction (effort that people spend negotiating with others within a company but between different departments) is stifling. I am ready to set the bar higher for what makes me happy during the ~45 hr/week that I spend either at work or driving to and from it. I am heavily inspired and influenced by the Podcasts that I listen to (Do It Scared, Smart Passive Income, The Side Hustle Show, The My Wife Quit Her Job Podcast, The Jetsetting Family Travel Podcast, The Side Hustle School, and Shopify Masters). It could be the case that every podcaster artificially makes his or her area of expertise sound more glamorous than it really is, but I truly believe that each one of them has found a passion for what they are doing. And in effect, they look forward to going to work. Maybe not every day, but their drive to accomplish their long term goals keeps them pushing forward day in and day out. Right now, the primary long term goal that my job is helping me accomplish are my financial goals. There are definitely tons of soft skills that I am honing which will help me throughout my career, but I do not feel a personal connection with or possess an inclination rooted in my gut that drives me to go to work to make soap. I believe that the only way for me to find a project/business/job that will be a complement to who I am is for me to free up the time to “pursue other interests”. I’ve listened to the audiobook; I’ve heard these words. However, I must say, that steering towards the fear feels crazy. It takes a lot of convincing myself everyday that this is the right thing to do. But, wait a second. Am I supposed to quit my job because I fear the financial insecurity? If that were the only reason, then no. I’ve gone back and forth, but because my current career leaves me searching for what’s missing, I have decided that this fear that I have is a good fear. It will lead me toward growth. 4.) When opportunity knocks, you have to know how to listen. As you may remember, we bought a new house at the same time I quit my job. We weren’t looking for a new house. I was looking for a way to build an asset, and that dark and dirty row house with good bones plopped right into our laps. Throughout the purchasing process, as the seemingly insurmountable quantity of work loomed ahead of us, we tried to find reasons not to buy it. The home inspection flagged a wonky-looking support beam in the basement. After inspection by a structural engineer, he said it didn’t even need to be there. Problem solved. We were stressing about 2 cracked windows on the front facade of the house. We learned that in order to replace windows in a historical district, the cost would be about $3k per window because they had to be custom made of wood. Upon further investigation, we learned that you can just replace the panes of insulated glass for $300. No big deal. We bought a house despite our best efforts; we just were following our intuition. More specifically, I should say that it was your mother’s intuition. She has an uncanny way of seeing the big picture. There would be no other moment in my career where I would have the required time to complete a rehab of that scale. I have been searching for a new blog idea. I could document my experiences in a new DIY blog and Youtube channel. I already have the rehabbing skills and some experience. This would be a way to leverage those skills. 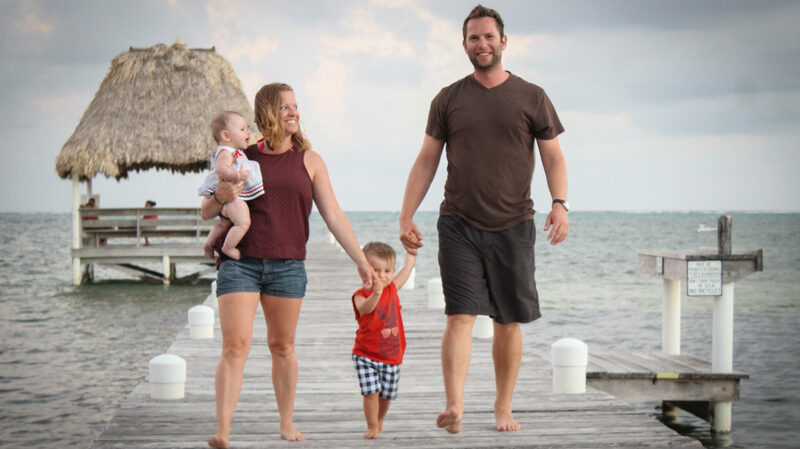 The most challenging part was that our other option was to travel as a family starting at 25% of the time and potentially increase it to even more than that if we could get our family travel blog to take off. It would be hard for the Universe to present a better opportunity and leave it visible right in the open. Although my head recognized the fit that this puzzle piece had with the rest of our lives, I had hard time convincing my gut. In fact, I tried pretty hard to ignore it. And that’s where your mother came in. Her intuition told her right from the beginning that this opportunity was worth exploring. So, use your Mom as an example of how to listen to your gut and hear the knocks of opportunity. Think about a time when you asked your mom a question about what to do or how to respond to a situation, and she gave you an explanation that seemed inadequate. There’s a good chance that she is listening to her gut. Her intuition tells her how to proceed. Watch your mom when she does that and take notes. I am learning this method of decision making. Quitting my job and buying a fixer upper has been an exercise in listening to my gut. My head has tried to convince me out of it over and over, but I know this is a good fit right now. I can only hope that my musings here are principles that you have seen me live by. Even if our current decisions do not go as planned, I know that these principles will help us land on our feet. I hope that they will also serve you well in your adventures.